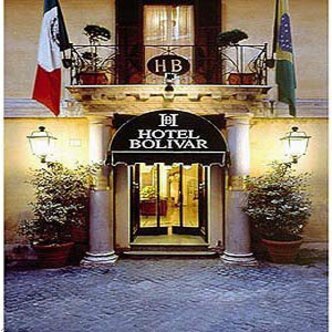 The Hotel Bolivar offers excellent service in an ideal location. It is situated in the centre of Rome between Piazza Venezia, Via Veneto, Fontana di Trevi, Piazza di Spagna, the Coliseum and the Forum Romanum. The very quiet and splendid rooms are all equipped with shower and bath, color TV, refrigerator and air conditioning. We also have an American Bar and a private parking area and are only 10 minutes from the Air terminal and the Stazione Termini. This first-class hotel is in a small, quiet square off main street and offers refined services. The hotel has a bar and a restaurant. The Hotel Bolivar can offer information about sightseeing tours, air and ship schedules to meet the needs of their guests. Airport transfer Hotel can arrange pick-up to and from the airport. Flight details to confirm.